We are starting to see the signs of Spring. 1. In January the raccoons come out of hibernation. Some believe they never really go into hibernation, but the naturalists who write their columns, swear that there is a month or so when they are not knocking over our garbage cans, exposing our secrets to the world, or at least the neighbours! They can be a real nuisance; but they are so darn cute. My neighbour tells me that raccoons are related to the bear family. Yes, I can see their resemblance to the Panda. 2. Children have already lost at least one of a pair of mittens, if not a hat or two, scarves plus lunch boxes, school bags, boots, socks, shoes - you name it. 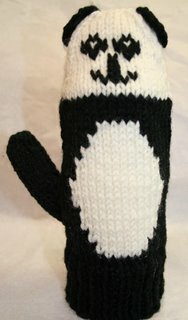 However, it was because of the lost mitts, that I created the patterns for my character mittens. 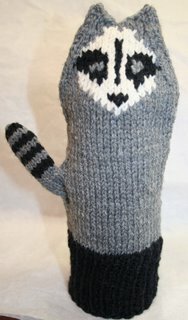 The idea is to knit just one mitten (not a pair) of a whole series of animal mitten patterns. They fit either hand so you just take another mitten from the menagerie of mitts, if a mitten gets lost. You're on your own for the other things! 3. February 2, of course is Ground Hog Day. The creatures of the earth are getting restless. The days are growing longer. We pick Forsythia and bring it in for forcing. In a month's time, the Cardinal's song will change to that wonderful, "what cheer, what cheer - pretty, pretty, pretty". He's applauding our knitting, of course! Thank heavens for the Cardinals and the Blue Jays - they stay with us throughout winter and add colour to the grey days. 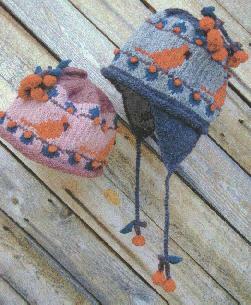 Barb Telford of Woodsmoke Woolworks has created several wonderful hats with these winter birds as motifs. 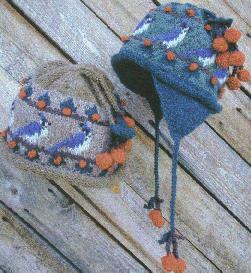 Barb's patterns in sizes from XS to XL are available from your LYS or on-line retailer. 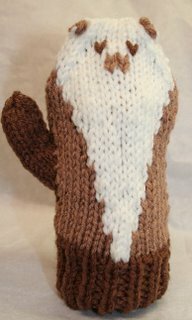 "Today I put aside a cable sweater that I am working on, picked up the important needles and worked out a tiny lion and giraffe. Not a clue why that was so important. At least the birds I can explain. We are on an important migratory bird route here. Every year we have a big weekend celebrating our fine feathered friends. I was asked to do something that we could give to our special guest speakers. Things with birds were appropriate so voila bird hats. The cherries are there so they have something to eat. I am a bit obsessed with food, what can I say. I have some waterfowl patterns as well but still ( years later ) haven't got a danglie that makes me happy. I kind of liked the cattails but they are just a bit too close to looking like something from the wrong end of the bird. " Thanks so much Barb - I love the way the creative mind works - never in a direct line - watch out for lions and giraffes some where. 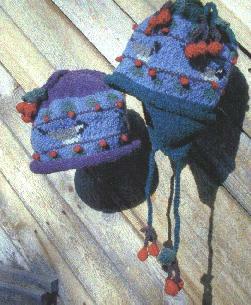 The "danglies" that Barbara refers to are the wonderful miniatures that hang like tassels from her hats. I have begged her over the years for more - maybe in other garments. But art has its own agenda.